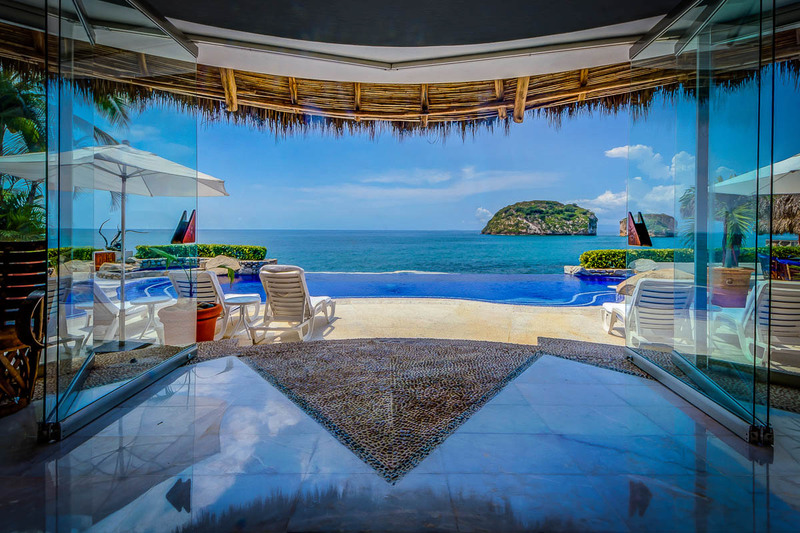 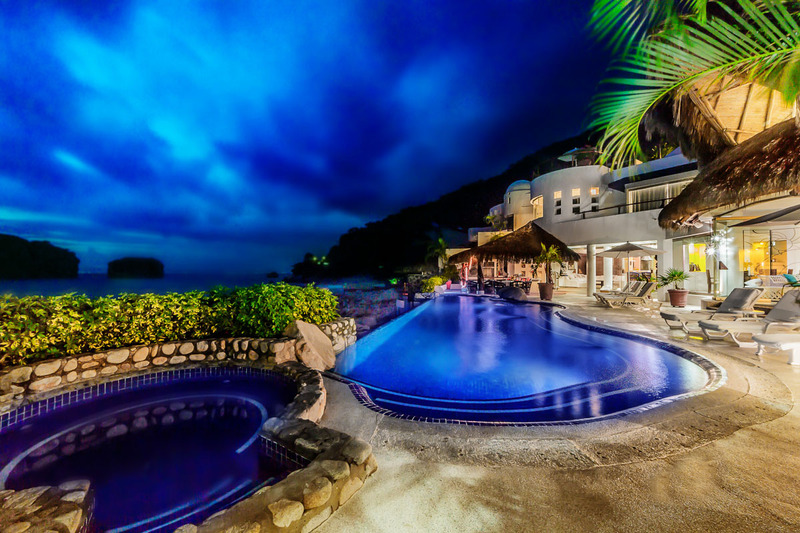 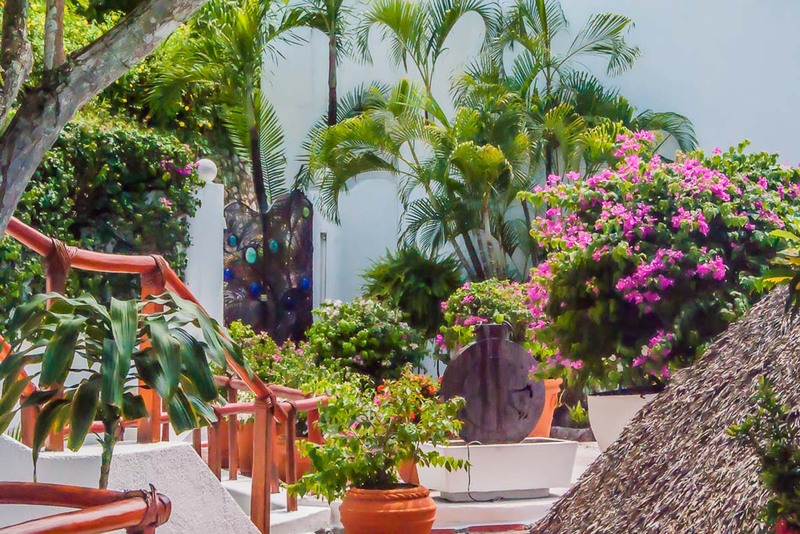 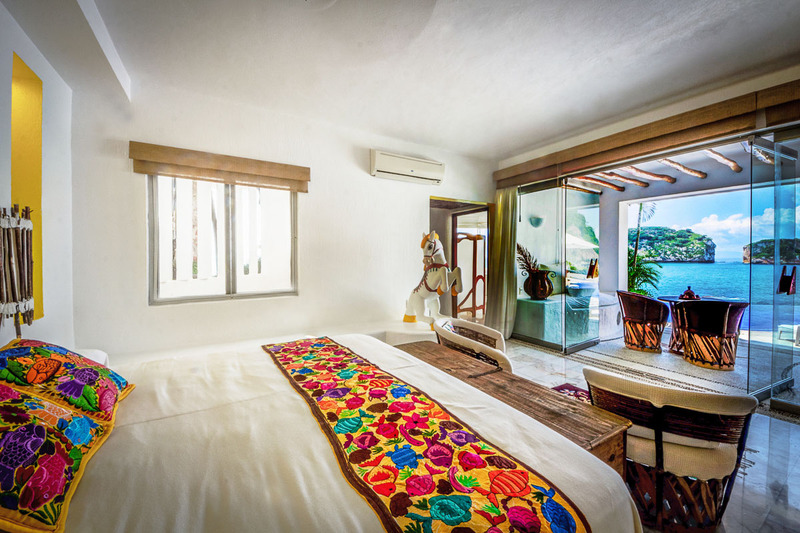 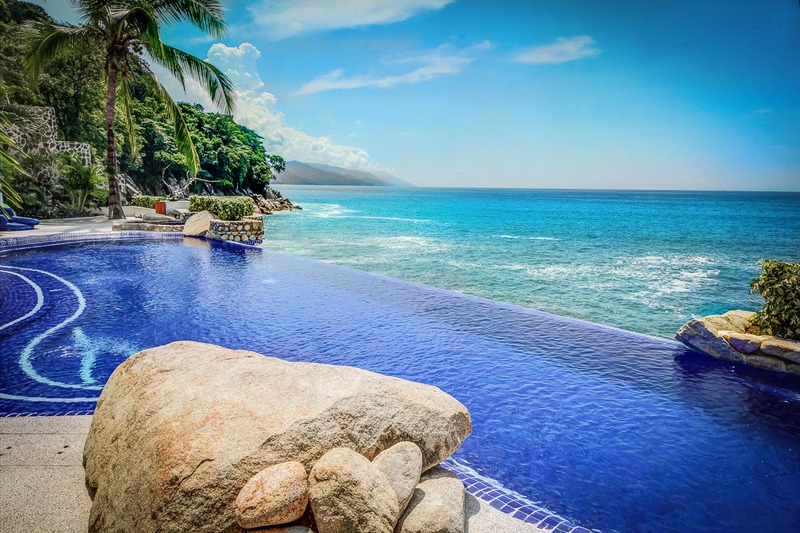 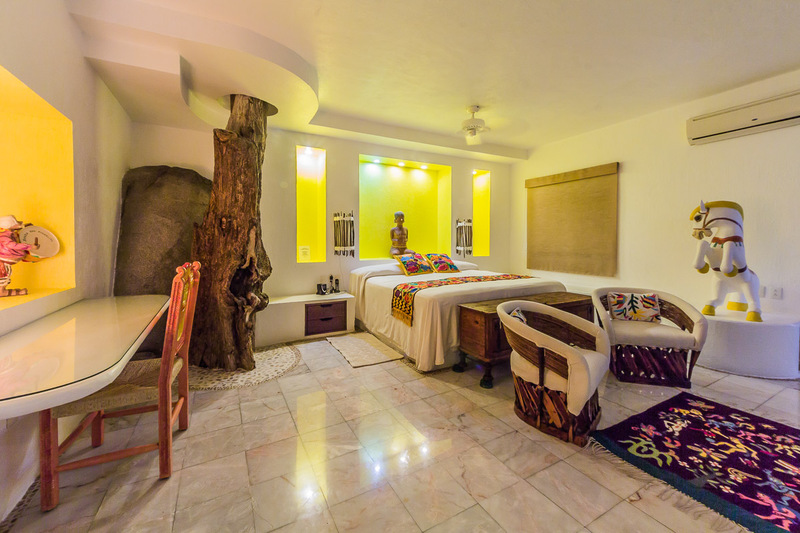 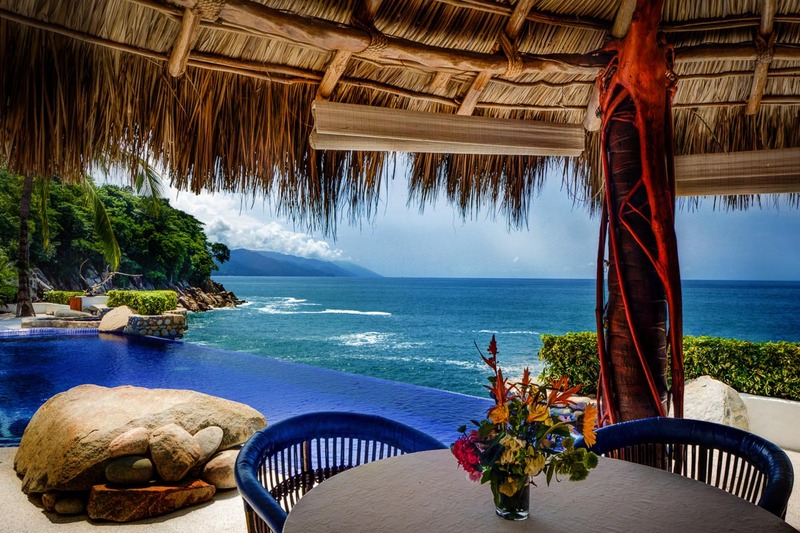 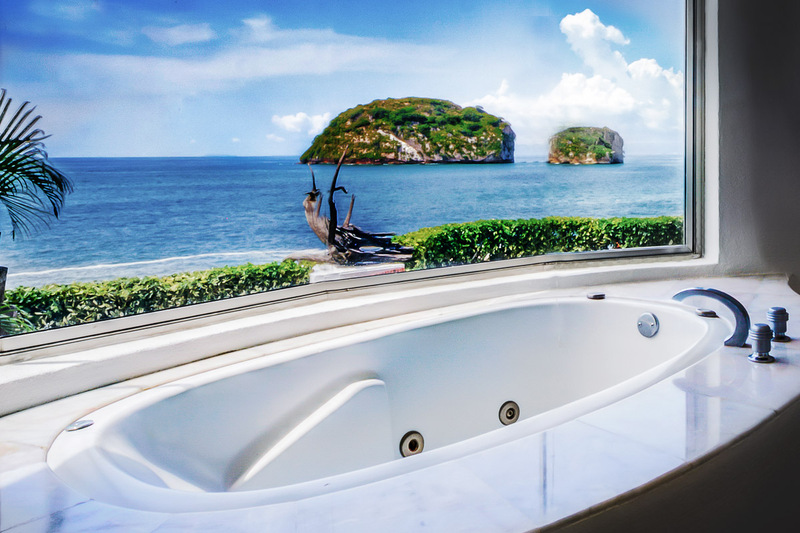 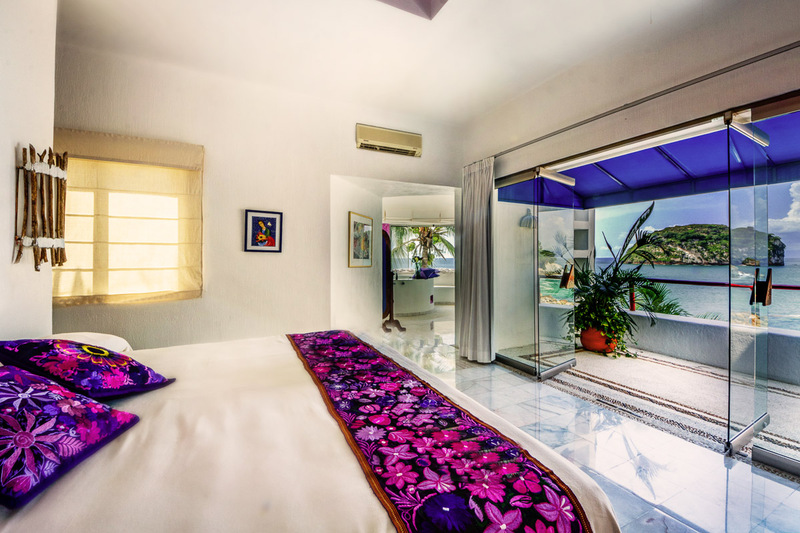 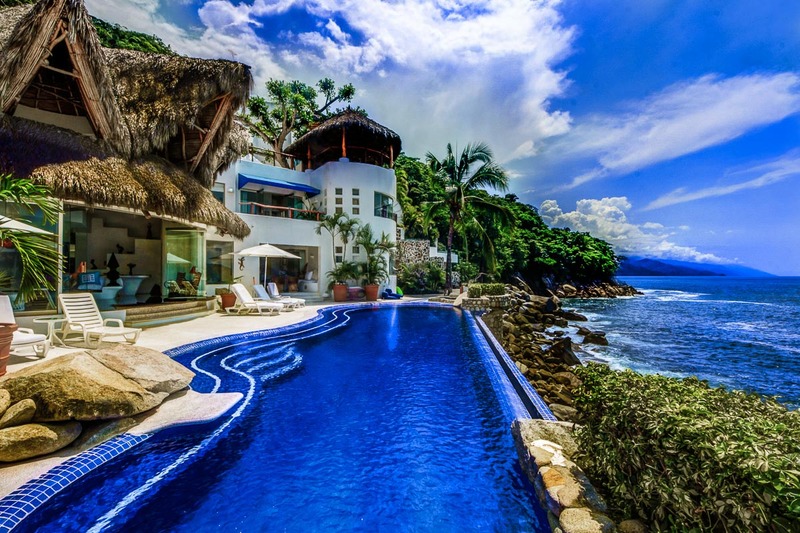 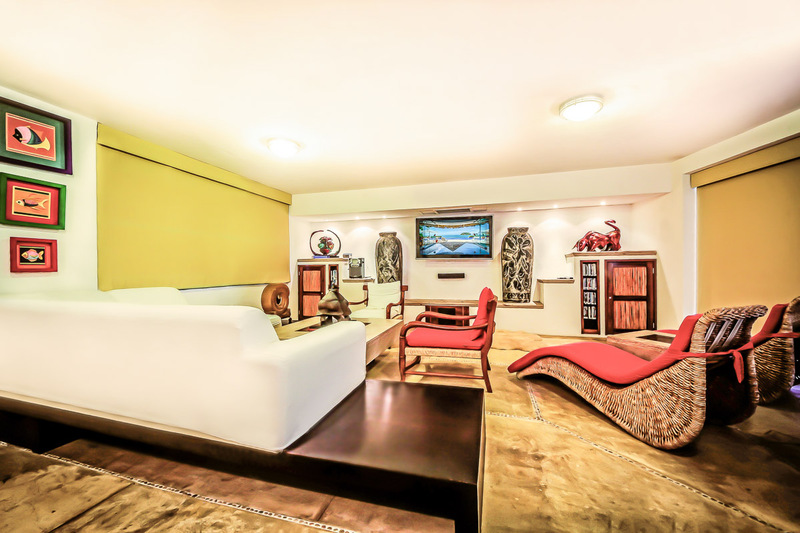 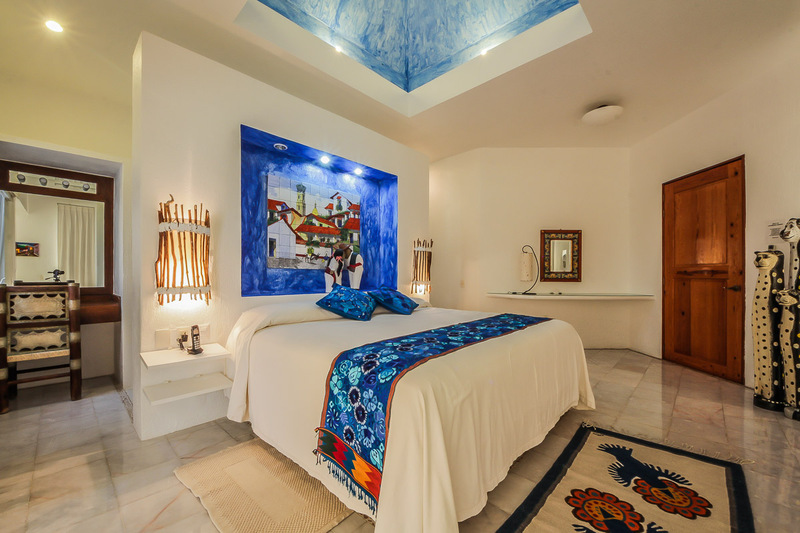 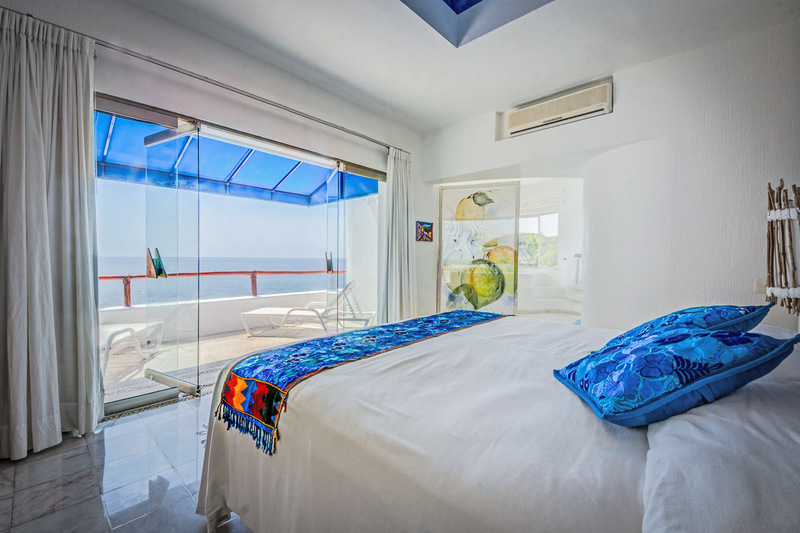 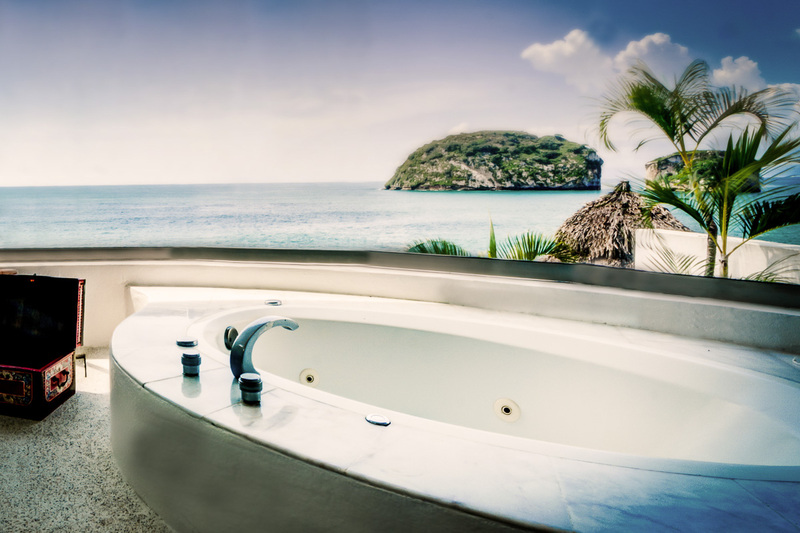 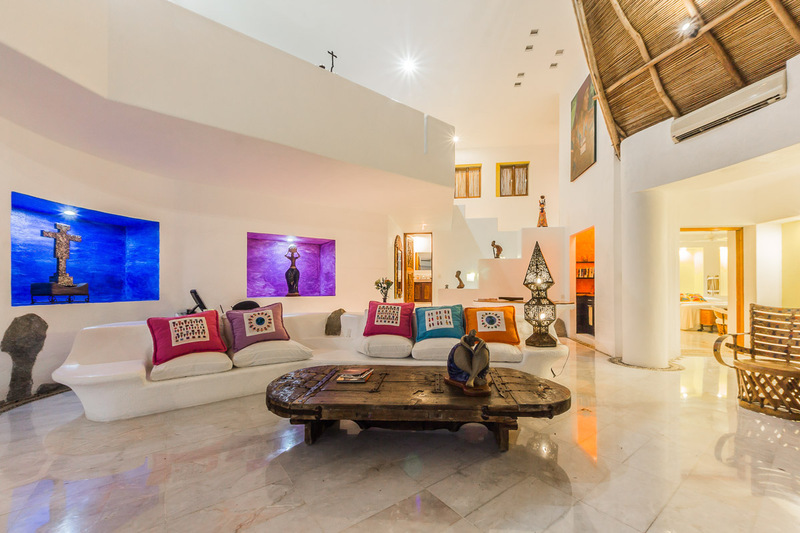 The focal point and highlight of our Puerto Vallarta villa is the circular palapa-covered living room with its 180 degree panoramic vista of the sea and Los Arcos, the offshore trio of massive boulders that jut from the sea to form Puerto Vallarta’s best known landmark. 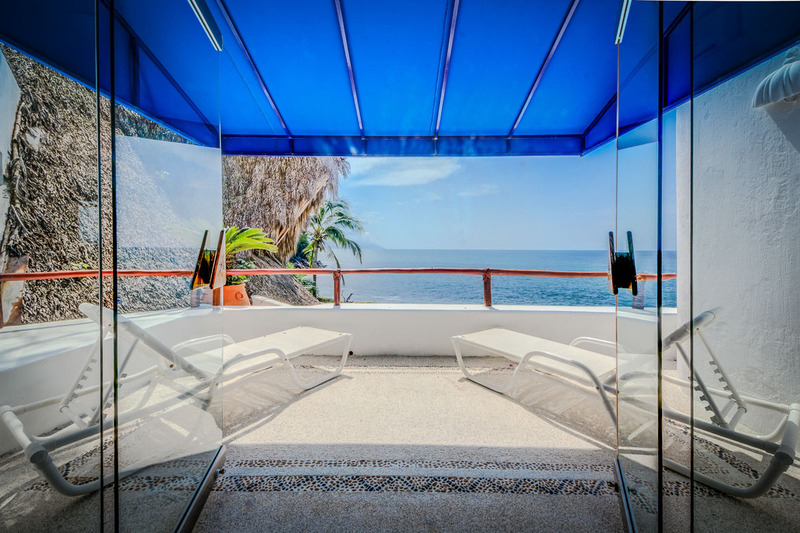 Our Puerto Vallarta villa’s spacious living room, its adjacent open dining area, and an ocean side gathering and entertainment terrace with its own palapa overlook a jacuzzi and fifty-foot long “infinity” pool, strategically situated to create an illusion of ocean and pool blending into a spectacular vista of gently crashing surf and offshore rock formations. 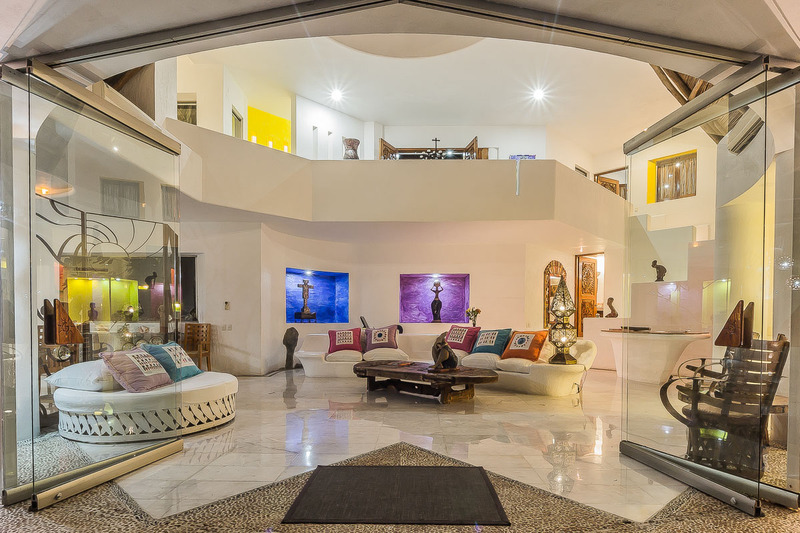 Luxurious white marble floors are outlined with traditional pebble designs and hand-set in concrete by native artisans who used more than 100,000 tiny stones to complete their mosaic. 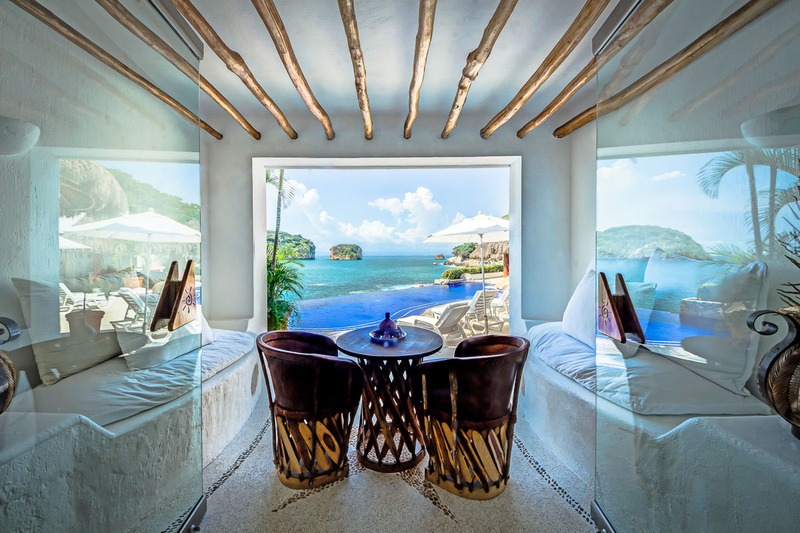 Windows, wherever used, are situated for a single purpose, to emphasize the spectacular vistas offered from every vantage point. 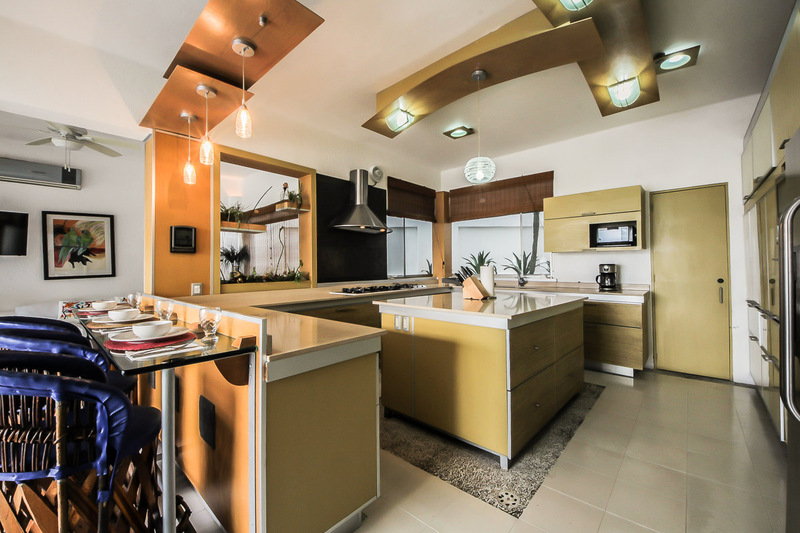 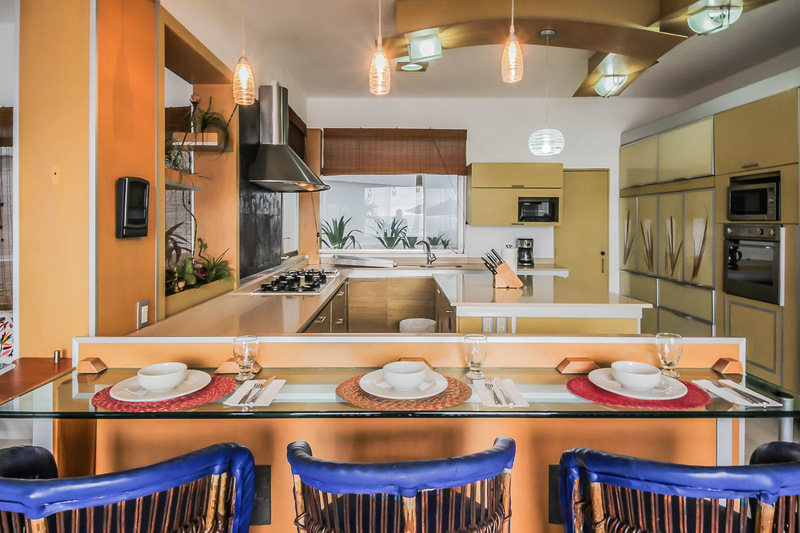 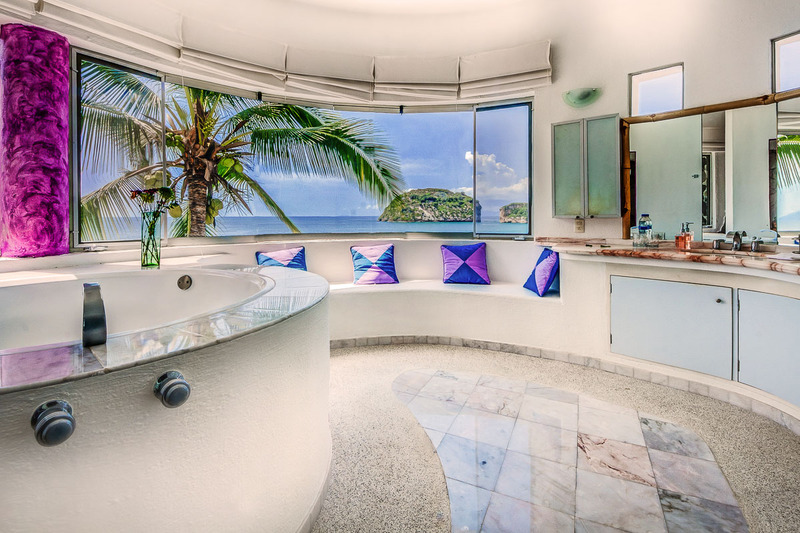 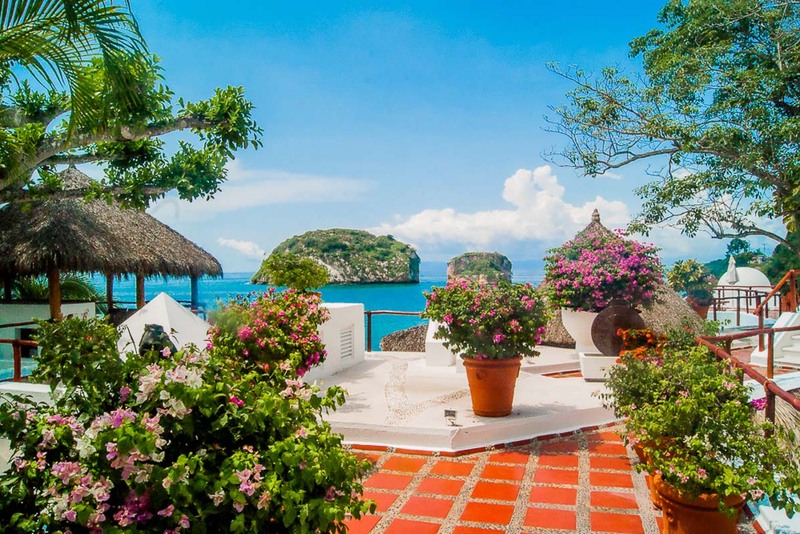 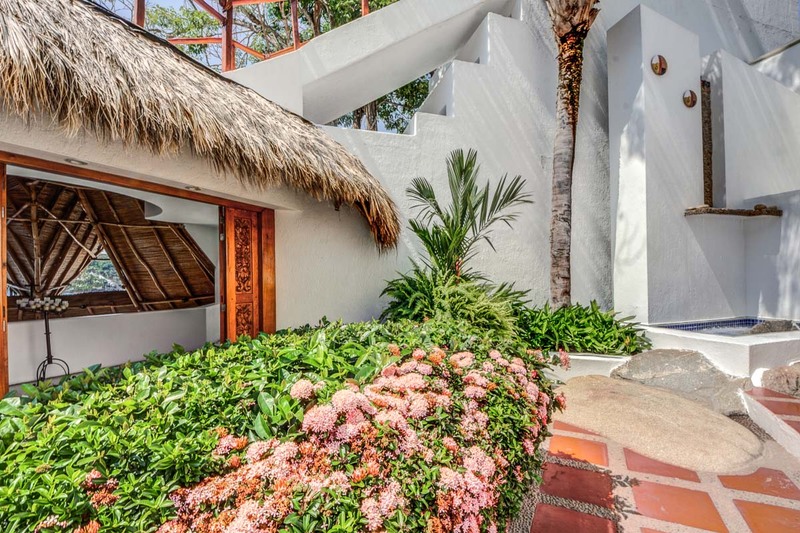 The four bedrooms, outside palapa-roofed entertainment area, TV room and breakfast area, and modern American-style kitchen are all situated to overlook the Pacific, Los Arcos, and stunning oceanside cliffs. 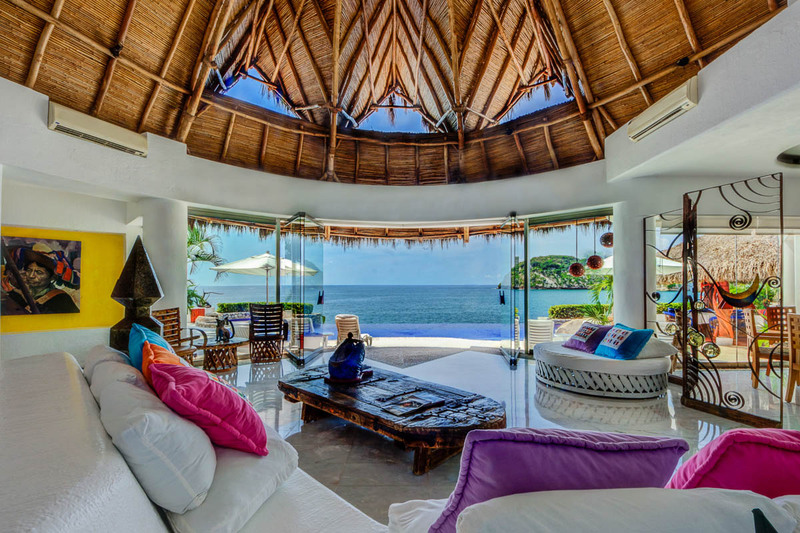 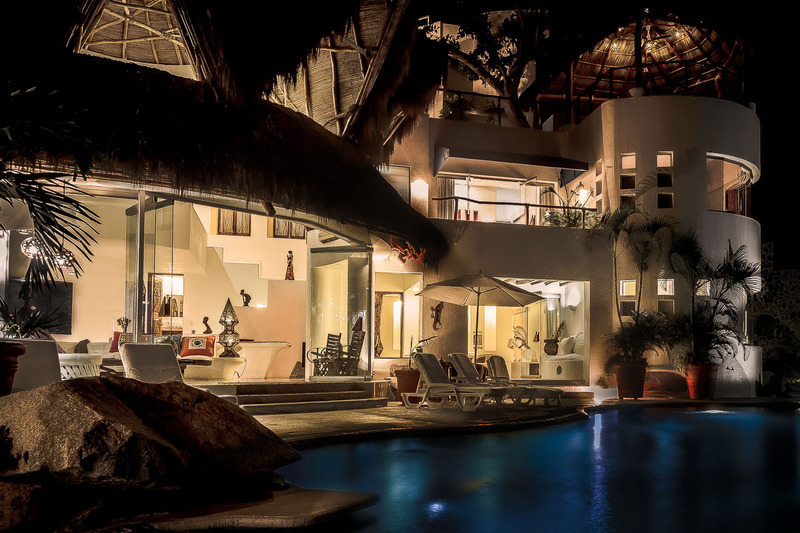 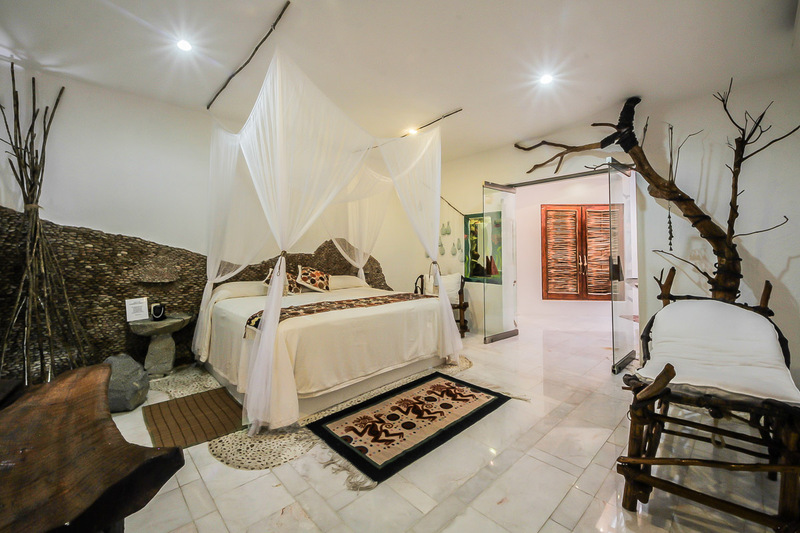 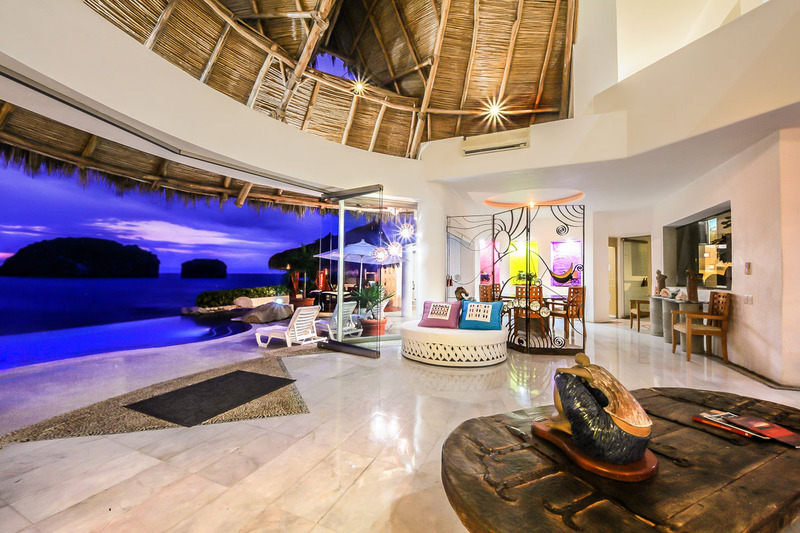 The peak of the soaring palapa is 35 feet above the living room floor and its thatched palm roof is of a weather proof design with a hidden concrete liming designed to cool the interior and reduce maintenance. 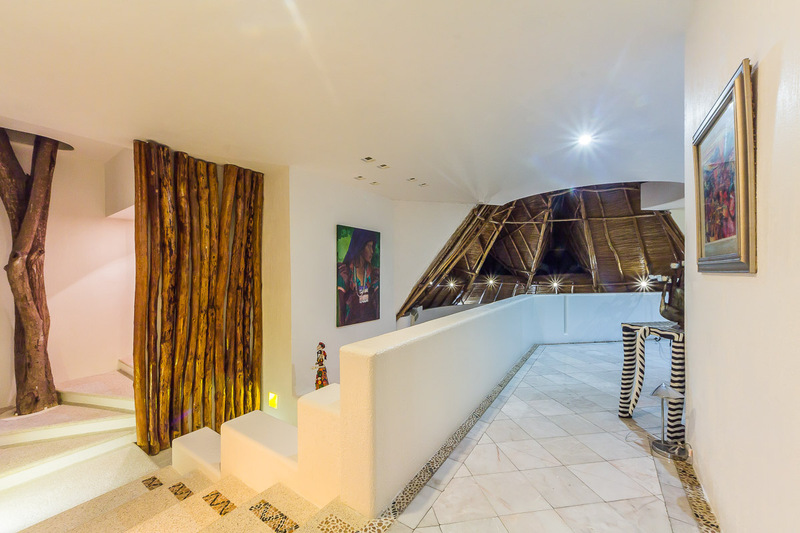 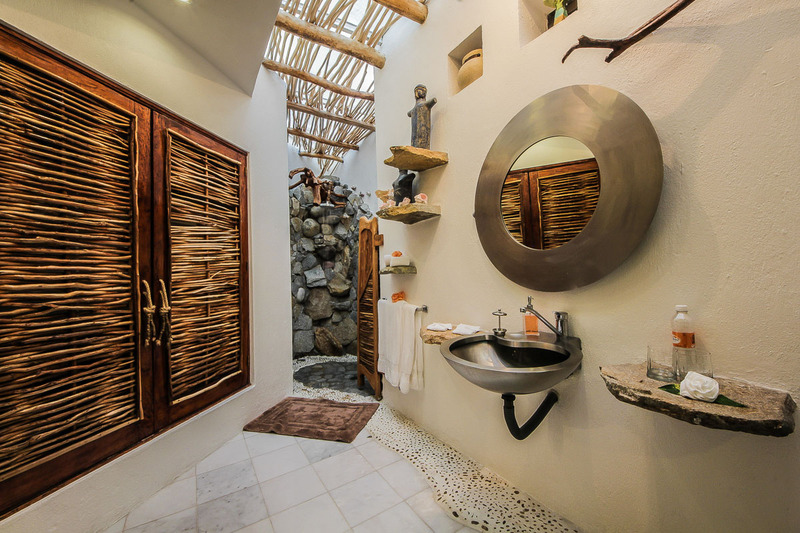 The peaked interior of the palapa dominates the living area, its angular ceiling lined with over 3,000 bamboo reeds harvested from nearby jungle hillsides and individually nailed in place by native workers.